BACKGROUND: According to a Cochrane review, continuous support during childbirth increases the mother's chances of a vaginal birth without identified adverse effects. However, this evidence-based practice is not universally implemented. The objective of the study was to identify challenges encountered in implementing continuous support during childbirth in public hospitals in the North West Province of South Africa. METHOD: An explorative, descriptive and contextual qualitative approach was used. The data were collected during 2013 by conducting focus group interviews with 33 registered midwives who had worked in maternity units in three selected public hospitals in the North West Province for at least two years. RESULTS: Midwives identified challenges that negatively impacted the implementation of continuous support during childbirth at organisational and interpersonal levels. At the organisational level, challenges included human resources, policies and guidelines as well as the architectural outlay of the maternity units. The personal challenges related to communication and attitudes of nurses, patients and their families. CONCLUSIONS: Organisational and personal challenges had a negative impact on the provision of continuous care during childbirth. Continuous support during childbirth enhances the chances of a normal vaginal birth and according to a Cochrane review, such support has no identified adverse effects (Bohren et al. 2017). The comfort of continuous support contributes to non-pharmacological pain relief (Simkin & Bolding 2004), as it promotes the steady release of endorphins (Bohren et al. 2017). Labour support creates a feeling of security and satisfaction, enhancing positive labour outcomes (Marshall, Raynor & Nolte 2016) with a reduced risk of medical interventions such as caesarean sections (Brainbridge 2010). Continuous support during childbirth can be provided by health professionals such as midwives (ideally, according to Aune, Amundsen and Aas 2014) or nurses, but also by doulas or laypersons, including family members. A doula is an experienced labour companion who provides emotional, informational and physical support throughout the entire birth process to the woman and her husband or partner (Medforth et al. 2009; van der Westhuizen 2011). Doulas can be appointed by the maternity unit or, in the case of a doula in private practice, by the woman herself. The current study focused on all aspects of continuous support provided by all these stakeholders. 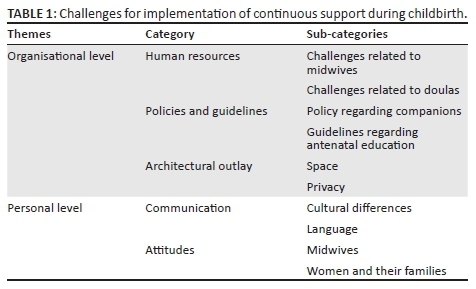 Although best practices for continuous support during childbirth are known, they are not generally implemented, either internationally (Bohren et al. 2017) or in South Africa (Brown et al. 2007; Maputle & Nolte 2008). According to Brown et al. (2007), the level of care in South African is not ideal because most women do not benefit from the support of a childbirth companion. A South African study reported that mothers would prefer a childbirth companion, but were not informed about this possibility (Maputle & Nolte 2008). Research on barriers impacting the implementation of continuous support during childbirth was conducted in three Arab countries (Lebanon, Syria and Egypt) (Kabakian-Khasholian, El-Nemer & Bashour 2015). Identified barriers included the absence of policies, non-optimal infrastructure of health care facilities, limited knowledge and negative attitudes of health care providers and managers. Behruzi et al. 's (2010) study, conducted in Japan, identified four groups of factors: rules and strategies, physical structure, contingency factors and individual factors. In a study conducted in Buffalo City, South Africa, Rala (2013) reported that few women knew that they could bring a companion of their choice to support them during childbirth. The question arose as to what midwives, working in selected public hospitals in the North West Province of South Africa, perceived to be challenges in implementing continuous support during childbirth. Knowledge about these midwives' perceptions could contribute to the formulation of recommendations for promoting continuous support during childbirth. Three public hospitals (one district, one regional and one large level 2 hospital) were selected to represent the different sizes of hospitals in the North West. Annually, the district hospital conducts 2270 births, the regional hospital 3100 births and the large hospital 5427 births. The population comprised all midwives working in the maternity units in the three selected public hospitals. Knowledgeable participants were selected purposefully, as they could provide rich data. The inclusion criteria specified that participants had to be registered with the South African Nursing Council (SANC) as registered midwives and should have worked in these maternity units for at least two years. What challenges impact the implementation of continuous support during childbirth in the selected three public hospitals in the North West Province of South Africa? Focus group interviews were conducted from August to October 2013. At least one focus group was conducted in each public hospital until data saturation occurred. The focus groups were recorded and transcribed. Group dynamics in the groups and non-verbal communication cues were recorded as field notes (Botma et al. 2010). Data were analysed using thematic analysis (Vaismoradi, Turunen & Bondas 2013). Verbatim quotes were linked to support the reflected themes, categories and sub-categories. The researcher and an independent co-coder analysed the same data independently and then entered into a consensus discussions to enhance trustworthiness. Six focus groups interviews involving 33 registered midwives were conducted. Most of the participants (88%; n = 29) had more than five years' experience, were women (97%; n = 32), and aged 30-55 (94%; n = 31). Of the participants, 40% (n = 13) had an additional qualification in advanced midwifery. The study revealed that midwives perceived challenges at both organisational and personal levels. At the organisational level, the identified categories related to human resources, policies and guidelines as well as the architectural outlay of the maternity units. Two identified categories at the personal level were challenges of communication and of attitudes. The results are discussed based on Table 1. The codes at the end of the quotations each refer to the hospitals where the focus groups interviews were conducted. The challenges regarding implementation of continuous support during childbirth are related to human resources, policies and guidelines as well as architectural outlay. Participants emphasised that staff shortages severely limited their ability to provide continuous support during childbirth. The ability to provide continuous support during childbirth depends on the staff-patient ratio. The National Institute for Health and Care Excellence (NICE) guidelines on safe midwifery staffing for maternity settings in the United Kingdom (2015), stressed that safe staffing implies providing one-to-one care by a midwife for every woman in established labour. One-to-one care would imply that the midwife is able to provide continuous support as she will be able to be with the woman continuously. However, even in the United States of America (USA) and in Canada, midwives usually have to attend to more than one woman in labour simultaneously (Gilliland 2011). Igboanugo and Martin (2011) reported based on their study conducted in the Niger delta that staff shortages could affect midwives' workload and pose a potential threat to the safety of childbearing women. In the Malawian study of Thorsen, Tharp and Meguid (2011), it was also found that burnout among health care workers contributed to poor patient outcomes or impaired performance. The second sub-category under human resources concerns challenges related to doulas. Gilliland (2011) reported that trained doulas utilise intricate and complex emotional support skills when providing continuous intrapartum support. The doulas are sometimes expected to do tasks not primarily part of their scope or role. Although breastfeeding and the accreditation as a baby-friendly hospital is important, it must not be seen as the doulas' work to assist the new mothers if they are primarily appointed as doulas to provide continuous support during childbirth. The absence, formulation or lack of implementation of various policies and guidelines present challenges for the implementation of continuous support during childbirth. The first sub-category concerns policy regarding companions. Policies and guidelines deal with the management of pregnant patients and also specify what type of management should be provided at each level of care (Beksinska, Kunene & Mullick 2006). It can be difficult to implement continuous support during childbirth if this practice is not specifically mentioned in policies and guidelines. According to Behruzi et al. (2010), the most important barriers identified in providing humanised birth care (including continuous support) were institutional rules and strategies that restricted the presence of birth companions. The presence of a companion is considered to be so important in Brazil that a law, the 'Companion's Law', was promulgated to oblige health services to allow the presence of a companion, chosen by the parturient woman, throughout the period of labour and birth and the immediate postpartum period (Brüggemann et al. 2014). The Guidelines for Maternity Care in South Africa (South Africa. National Department of Health 2016) specify how maternity services should be rendered. These guidelines state: 'allow family and friends to provide companionship during labour' (p. 41) and 'promote companionship in labour' (p. 42) as a strategy to promote non-pharmacological pain relief. However, no provision is made in the official maternity record documents for recording the presence of such a companion. The national guidelines are intended to be contextualised for each facility which is supposed to develop its own protocols based on the national guidelines (South Africa, National Department of Health 2016). None of the hospitals included in the current study had specific protocols regarding the presence of birth companions. The second sub-category under policies and guidelines concern guidelines regarding antenatal education. It would be worthwhile if women are encouraged to bring their own companions along when they are in labour. Khresheh (2010) found in her study conducted in Jordan that support by a female relative is a cost-effective and beneficial practice in low-resource countries. Beksinska et al. (2006) also recommended that health education during antenatal care should inform pregnant women that they can choose to bring a childbirth companion to the maternity unit for providing continuous support to enhance the birth experience. Well-designed hospital environments, including the size and scale of hospital buildings, the layout, lighting and landscape, could impact women's childbirth experiences (Igboanugo & Martin 2011). Internationally, the design of birth rooms is attracting much attention (Brüggemann et al. 2014; Hammond et al. 2014; Symon et al. 2013). The nurses in the study of Brüggemann et al. (2014), which was conducted in Brazil, mentioned the inappropriate physical structure of the hospital unit as a reason why they did not allow companions in their delivery rooms. The midwives reported that the physical layout of the maternity unit posed a challenge to provide continuous support during childbirth. Lothian (2004) emphasised the importance of privacy during childbirth and described the companion as someone who listens, watches and quietly and patiently encourages the parturient woman, making sure that she is not disturbed and has the privacy she requires. Lewis (2012) reported that most midwives worked hard to establish rapport with women to ensure that their experiences of care received during the childbirth process would be positive. Research conducted among women originally from Africa but currently staying in Australia (Murray, Windsor & Parker 2010) reported that the women's English skills and the health providers' ability of using interpreters impacted the effectiveness of their communications. Taniguchi and Baruffi (2007) presented similar results in that Japanese women living in Hawaii cited the language barrier as the most difficult factor during pregnancy and childbirth. Language differences also imply cultural differences. Taniguchi and Baruffi (2007) and Noble et al. (2009) agreed that the childbirth experience is influenced uniquely and sensitively by each culture; hence, culturally sensitive approaches would facilitate good birth outcomes and positive childbirth experiences. Noble et al. (2009) stated that caring for labouring couples required culturally competent midwives who could recognise culture-related responses to provide appropriate care to women and their babies. Akhavan and Edge (2012) reported on a project in Sweden where immigrant women were supported by doulas who understood their culture, customs and language. The participating women reported that, in addition to support during labour, doulas provided important information and continuity of care, which apparently increased their satisfaction with and trust in maternity health care. If the support providers display caring attitudes, they re-assure the woman and thereby enhance the experience of continuous support during childbirth. Disrespect and abuse in maternity care are attracting much attention: both globally (Bohren et al. 2015; Bowser & Hill 2010) and in South Africa (Jewkes & Penn-Kekana 2015; Kruger & Schoombee 2010). Bad attitudes of health care providers could be considered to be a type of disrespect and abuse. Kruger and Schoombee (2010) explained the reason for the staff's bad attitude in that they might be disempowered within the hierarchy of the medical system and feel frustrated, disappointed, resentful and even enraged in a context where they cannot be in control and cannot provide care as they might want too. This bad attitude can have serious consequences. In addition to negatively affecting continuous support during childbirth, Igboanugo and Martin (2011) commented that the unwelcoming attitudes of staff members toward pregnant women could create social and psychological barriers, negatively affecting these women's willingness to use health care services. The same authors maintained that poor staff attitudes could cause women to decline orthodox care and give birth at home or without skilled attendance. Kruger and Schoombee (2010) concluded that the reality of shortage of staff makes it impossible for midwives to always be present. In such circumstances, it seems likely that they will have to make conscious decisions as to who will receive care. This may mean that certain kinds of patients ('difficult', 'disobedient' and 'undeserving' patients) will systematically not be attended to. This might be true for the 'difficult' families too. The study participants indicated that continuous support during childbirth would be ideal but was not implemented in their maternity units because of organisational and personal challenges. The main challenges seem to be staff shortages and bad attitudes. A midwife (meaning 'with woman') is the ideal person to provide continuous support (Aune et al. 2014). However, in light of the limited number of midwives and their workloads, the midwife should at least facilitate continuous support by another suitable person. All women must be encouraged to identify a person they would like to accompany them during childbirth, and ideally these persons should be orientated. In addition, a doula can be extremely valuable in supporting the woman and conditions must be as favourable as possible to enable them to perform their function optimally. Antenatal health care providers should inform pregnant women about the benefits of continuous support during childbirth and about their choice of preferred labour companion. Companions should be informed about their expected role in providing intrapartum support. Interested community members should be identified and receive doula in-service training to provide continuous support during childbirth. Family members selected as companions should receive information as to how to provide continuous support during childbirth. A friendly, welcoming and enabling environment in labour rooms where the patient can be surrounded by her choice of preferred companion for continuous support during childbirth should be provided. There must be enough posts for advanced midwives, registered midwives and doulas to provide optimal care - including continuous support during childbirth. Agency staff should be oriented regarding continuous support during childbirth. The importance of continuous support during childbirth should be emphasised in both the undergraduate and postgraduate midwifery curricula. Clinicians should also be competent in terms of communication. This goal can be achieved with cross-cultural training or the use of interpreting services to enhance continuous support during childbirth. Antenatal policy and guidelines should explicitly mention health education regarding continuous support during childbirth and pregnant women should be encouraged to identify a companion of their choice. Each maternity unit should develop a policy about the presence of persons who can provide continuous support during childbirth. Culturally sensitive language policies should be available to ensure that midwives work in cross-cultural situations with backup interpreters to improve continuous support during childbirth. A list of interpreters should be available in maternity units. Developing a model of continuous support during childbirth appropriate to specific South African contexts. Establishing a model for patient:midwife ratios to determine how many midwives and doulas are needed in maternity units to render continuous support during childbirth. The study was conducted in the public sector in the North West Province, thus limiting the findings only to these hospitals. Some midwives were working in shifts, including night duty, which meant that some could not keep their focus group interview appointments. Midwives with less than two years' experience in labour wards were excluded from the study. Their perceptions about challenges affecting the implementation of continuous support during childbirth might have added value. Only midwives participated in the focus group interviews. Consequently, women's experiences and perceptions about continuous support during childbirth were not addressed. The authors thank the midwives for their contributions, Dr Belinda Scrooby for assistance during the qualitative data analysis process and Louise Vos and Erika Rood for providing library services. N.S.S. was the master's student who designed the study and collected and analysed the data under the supervision of A.d.P. N.S.S. and A.d.P. drafted the first version of the article. C.S.M. conceptualised the study and revised the article. All three authors approved the final version of the article.